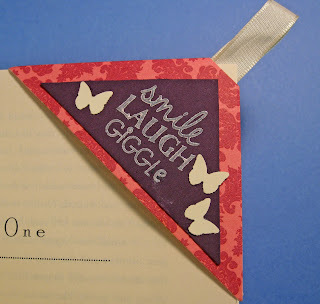 Here are 2 bookmarks I made for 2 color challenges. The Pink Elephant Challenge was to use brown, turquoise and a neutral. 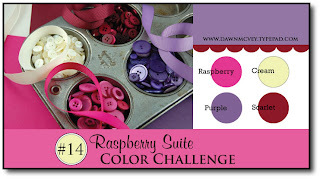 Dawn McVey's Raspberry Suite required a scarlet, purple, neutral and raspberry. Check below for the details. The DP is 4x4 and pale paper is 3x3. These are soooo simple to make it is unreal!! I will try to make a video and post it. No promises. Tomorrow is our first day back at school so I will do my best! Accessories include ribbon by SU Taffeta very vanilla and grosgrain tempting turquoise and SU brad rhinestone ice circles. I used my SU cutter kit to softly tear the edges on the turquoise paper. Ink- SU white craft and then embossed with clear embossing powder. Let me know what you think! As a teacher I value constructive criticism. Have a great Wednesday! This card uses SU Stampin Up paper and Dawn's own Mod Squad and my nestabilities. I punched out the front of the card and stamped my image inside. The size of the card is 4.24 square. The base is cream SU paper. More great stamps by Dawn & PI. I used the Polka Dot Basics II and Mod Squad sets. My background was created with the polka dot set and SU Rose Red and Mambo Melon ink. I used the SU paper for my frame and some cream paper to stamp on and cream ribbon both by SU. The base card us SU Rose Red paper. I have only had one other chance to enter this challenge despite the fact that I am a huge fan and was aware of the other 13 challenges. Time.... there is never enough is there?